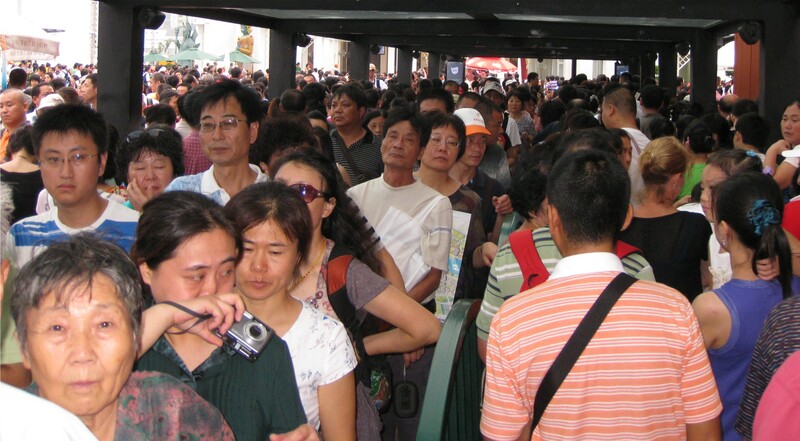 The population of China is 1.3 billion. It’s hard to comprehend just how many people that is until you have visited the World Expo in Shanghai and stood in line behind all of them. OK, it wasn’t really all of them; on the two days we visited the Expo recently, the attendance figure for each day was a mere 394,000. It just seems like more people when you are crammed together for hours at a time in 90° heat and 90% humidity. Here’s another way to look at the very large number of people who are attending the Shanghai Expo. Close your eyes and imagine all the spectators who saw all the major league baseball games last year: Yankee Stadium, Dodger Stadium, Wrigley Field… all 30 parks, for the entire 2009 season. All right, do you have that mental picture? That was roughly 74 million people. When the 2010 Shanghai Expo closes on October 31, the total attendance will, in all likelihood, exceed that. Estimates are that 80 million will have visited during its six-month run. Lines at some of the pavilions have been as long as 9 hours. Yes, nine! Sally and I couldn’t get into the host country’s pavilion, because in order to do so, one has to have a reservation. To get a reservation, one has to show up several hours before the park is even open. And then, reservation in hand, wait some more. No, thanks. Almost two hundred countries are participants in the Shanghai World Expo. The big ones — U.S.A., France, Italy and so on — seem to use these events to buff up their image, stressing their technological innovations and creativity. Many have impressive multimedia presentations, or 360° movies of their scenic attractions. The smaller countries are there just to let people know they exist. We had a pleasant visit with a young woman named Alexandra in Liechtenstein’s exhibit. She encouraged us to take the bus to her country (it has no airport) and spend at least one night. “Just come to the town square of Vaduz, call out ‘Alexandra!’, and I will show you around,” she said with a smile. Judging from Liechtenstein’s film presentation, it appears to be worth a visit. The same could be said of Dominica, which is not to be confused with the Dominican Republic. Thanks to two nice guys at Dominica’s exhibit, we learned that it is located in the Lesser Antilles, not too far from Barbados. And that they have a rum factory right on their island. Every country probably has its own reasons to put money into events like this, and host cities have met with varying degrees of success. The one Paris held in 1889 is the reason the Eiffel Tower exists; Seattle built the Space Needle for its World’s Fair in 1962. On the other hand, the one in New Orleans in 1984 — officially known as the Louisiana World Exposition — declared bankruptcy during its run. The legacy of the 2010 Shanghai World Expo will be the all-time attendance record for these events. The huge crowds are what I’ll remember about it, anyway. That, and the thunderstorm that dumped buckets of rain on us. My clothes will probably be dry any day now, but I’ll always have the memory. This entry was posted in Travel and tagged China, Shanghai World Expo. Bookmark the permalink. I was in what was called “the largest crowd to watch a football game” at the LA Coliseum. I always try to use that as a measure of the vastness of our population. It does little good. It’s a human defense mechanism to be incapable of comprehending the significance of large numbers. What game did you see, Monty? It wasn’t Super Bowl I, which drew only 62,000 spectators to the Coliseum. Sell-out crowds back then — for the L.A. Rams, USC vs. Notre Dame, and UCLA vs. USC — were in excess of 90,000. You guessed it, USC vs. Notre Dame, in the ’50s. It was over 100,000. Sitting in the closed end gave me a feel for the scope of the crowd. My dad later received an encyclopedia of sports that noted that game as having the largest attendance. According to the official Shanghai World Expo web site, total attendance for the six-month run was 73.08 million people. The biggest single day was October 16, when 1,032,800 people paid to be extremely uncomfortable.